Allan was born in 1904, the year Shettleston was founded and as a young runner made his name in the professional ranks, winning the Powderhall 10 Mile Championship five times between 1927 and 1932. In winning the Powderhall 10, Allan held the title of World Professional 10 miles champion, a title that could only be contested by a challenge match. Allan was challenged frequently over the years, the most memorable being from R.E.Cole of Hereford. Races were held at White City Racecourse, Glasgow, and on 7th July 1928 before a capacity crowd, Allan retained the title of World 10 mile champion. As was customary at the time Allan competed at Sports meetings and Highland Games throughout the country invariably being ‘scratch’ man on most occasions. He ran at ‘Royal Braemar’ and was chastised by the commentator for ‘warming up’ before the race- apparently not allowed when the King and Queen were present. At Powderhall in 1933 and 1934, Allan finished second and third,the winner being a pupil of his. This fact so impressed Allan that it pointed his way in athletics-finding and helping youth. Thus ended the professional career of Scally of Broomhouse and what Powderhall lost, Shettleston gained. 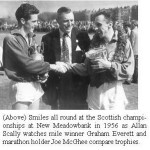 It was a great regret to Allan that he never wore the Blue and Gold of Shettleston, but as he considered his own running career over by then, he poured all his energy and experience into coaching and was main contributor to the clubs success in the late 1940s and early 1950s. The Champions coached by Allan are too numerous to mention, but some who did benefit from his advice include J.Flockhart, the first Scot to win International Cross Country honours with national championships following in the years ahead. Allan Watt , who won the English 100 yards title in 1947 and 48-who came to Shettleston as a high jumper and was turned into a sprinter by Allan. What were the characteristics to be found in one so influential? Some will say a great runner in his own right, the urge to win, or a rare genius for transmitting ideas and motivation to those around him.Undoubtedly his most outstanding qualities was the uncanny ability to see potential in young athletes in Track or Country.Allan also acted for many years as coach and official for the SAAA and was widely known across athletics in Scotland.